(Central Islip, N.Y., Jan. 23, 2015) – The Long Island Press has announced its annual winners of the “Best of Long Island 2015” awards, and QuackerJack has been chosen as the “Best Long Island Mascot.” This is the fifth consecutive year that QJ has earned the honor in online voting conducted by the Long Island Press. QuackerJack is hoping to celebrate this momentous occasion with everyone who helped make it possible! The lovable mascot is available to appear at events throughout the Long Island community. CLICK HERE to schedule an appearance with the Best Mascot on Long Island. 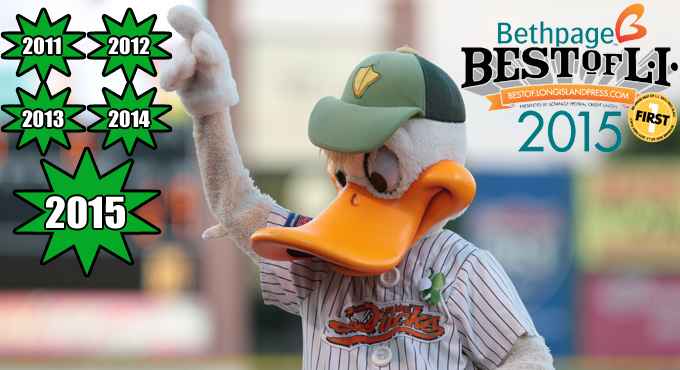 In addition, Ducks outfielder and hitting coach Lew Ford has been voted as the “Best Long Island Duck” and earns the award for the first time. The former Major Leaguer put together an outstanding year in 2014, his fifth with the Ducks, setting Atlantic League records in games played (140) and hits (189). In addition, he led the league in doubles with 40 and finished second in batting average (.347), RBI (95), runs (100), total bases (278) and on-base percentage (.415). Ford was also selected to play in the All-Star Game in July and named a Postseason First Team All-Star.